Pug alternative medicine is a growing field. Obviously it’s not just for Pugs but for all dogs and animals. Just as there are those who prescribe to alternative approaches for humans, there are people who believe in it just as strongly for their pet. It is sometimes referred to as “holistic” and is designed to treat the subject as a whole and to combine an approach that works with their mind, body and total environment. If this is an area of interest you should search out a veterinarian who combines a holistic approach with the traditional veterinary medicine. Pug alternative medicine is a part of some veterinarian's practices. A vet who uses Pug alternative medicine therapies will work to treat the whole Pug. Traditional medicine focuses on treating the symptom. If your regular veterinarian does not make this approach part of their practice make sure you discuss with him or her the fact that you are interested in this and will be seeking out someone who practices alternative medicine for animals. Herbal treatments – This can involve Chinese herbs or the Western approach to herbal medicine. In the Western approach an herb is matched to a symptom so many times you are using just one or two herbs to treat your Pug. In the Chinese approach a blend of herbs is used to bring the body back into balance. This approach has a foundation that goes back centuries and is quite sophisticated. Much of it is preventative in nature which is something we don’t do enough of in this country in our medical treatment. The purpose is to keep your body in balance for maximum wellness. Nutritional therapy – We believe this is a sound approach for any animal or person whether you believe in alternative medicine or not. This is a customized diet that focuses on healthy foods and is generally organic or preservative free. A properly prepared diet will make sure your Pug stays healthy and is one of the best things you can do from a preventative standpoint. Aromatherapy- This field is growing all the time for humans so why wouldn't it work for Pugs as well? After all, dogs have an incredible sense of smell and if certain aromas can affect you, why wouldn't it work on your little friend as well? There is not a lot of information about aromatherapy for dogs but we think this might be changing soon. Chiropractic – Yes, there are chiropractic services for dogs and people who use this method on themselves are true believers that a properly aligned spine can make a huge difference in their welfare. If you listen to those who believe in this approach, almost everything that goes wrong in your body can potentially be avoided by keeping your back properly aligned through periodic manual adjustments. Related to this is Massage Therapy that helps relax the muscles and reduce stress. Many times the source of pain is tight muscles and this kind of therapy can alleviate tightness. Acupuncture – The same approach taken with humans to relieve certain conditions (particularly pain) can be practiced on your Pug. Here needles are inserted at certain points in the body that correspond to the area of the body that needs to be healed.Magnetic therapy – This is popular with humans and is gaining popularity for pets. And why not? Many people have claimed that wearing magnets in a problem area can help alleviate pain and increase circulation. By doing this it helps your body with its natural curative powers to enhance the healing process. There are certainly medical skeptics who do not believe this works at all and much of the proof that this works is anecdotal. It makes one wonder how anyone got a testimony from a Pug to validate that it works. Ask your vet about this but there are definitely many people who believe this works wonders and many people who believe in natural healing for Pugs. 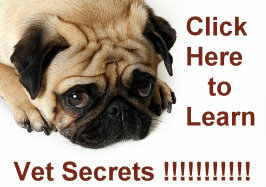 Do your own research on any of these methods before signing your Pug up for treatments. Pug alternative medicine is a growing field but it is definitely not as developed as the traditional veterinary medicine. You may have trouble finding specialists in the above field in your area. Here's an information resource on Natural Healing that you'll find very interesting.